The single most important step to improving your health and your family’s health (both therapeutically and preventively) is to stop eating fast food. It’s especially sad to see an entire generation of children being raised on fast food, with French fries being a staple in their diet. Am I saying I’m anti-French fry? No, not when they’re homemade using healthy ingredients and are served on occasion. 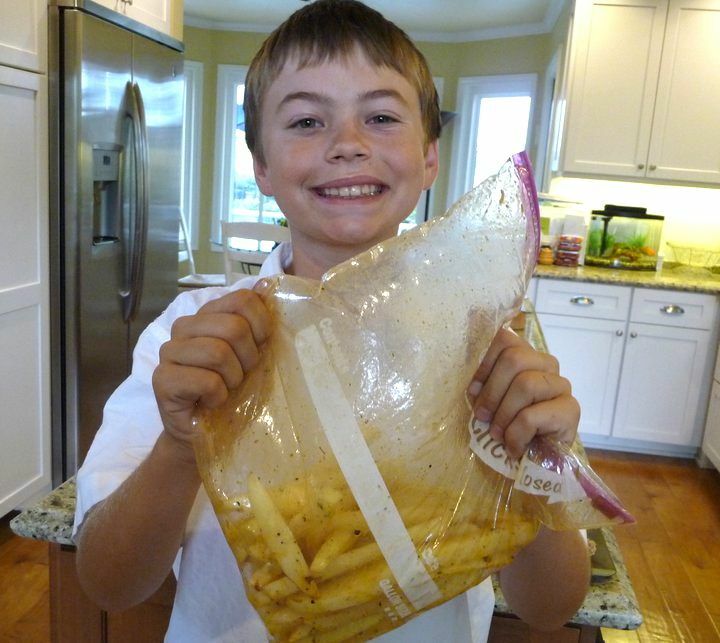 My boys love these fries, as do most kids, which is why they’re one of my favorite recipes to make in conjunction with the Healthy Chicken Nuggets for kid-parties. It really opens the door to talk about healthy eating when Moms see their kids devouring real food with a big smile on their faces! We hope you enjoy this recipe too! P.S. 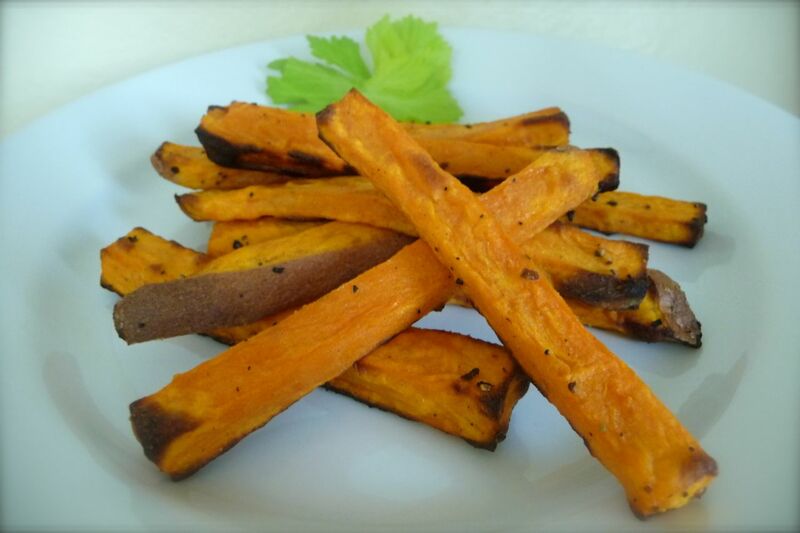 You can also follow this same recipe using yummy sweet potatoes to create delicious Sweet Potato Fries, see photo and note below! 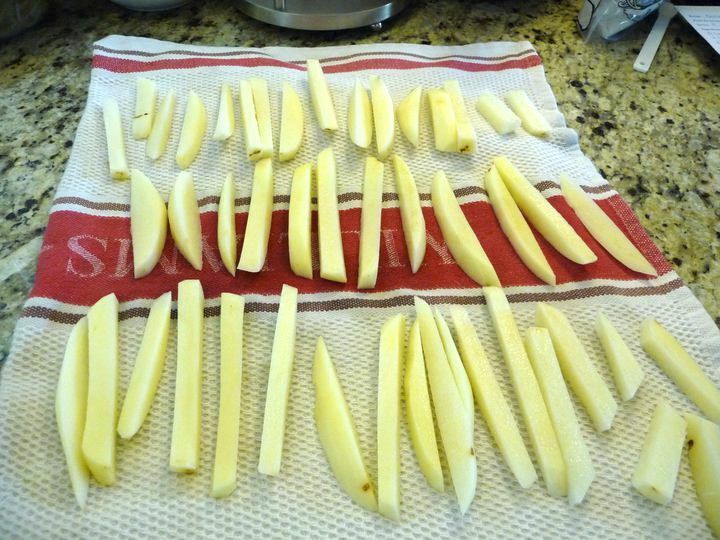 Slice fries and place on clean dish towel. Be sure to pat dry with clean paper towels. Making fries together is a fun way to get your kids in the kitchen with you and talk about why it’s so much better for us to eat real food! Encourage your kiddos to try something new! Replace the white potatoes with sweet potatoes for an extra yummy boost in nutrition. See recipe notes below for details! Serve with a turkey-veggie burger or healthy chicken nuggets. *If you have convection, that’s best. It's important to have high heat when baking fries and not to use too much oil, which is why you do not want to oil your baking sheet. 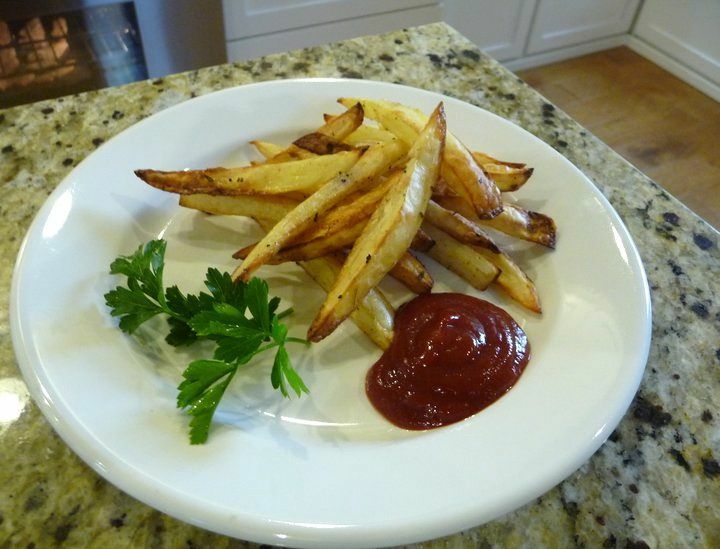 These fries will be softer than "fried" fries, but should not be soggy. If they are, reduce the oil and try up-ing your oven temp to 450 degrees, as ovens do vary in actual temperature (some run hotter, some not so much). These french fries are amazing! My family loves them. I make them at least once a week now. Can these fries be made in advance and sent to school with the kids in their lunch, heated in the microwave and still be tasty? Are you chicken nuggets good reheated in this same manner? Looking for school lunch ideas. Thank you! I stumbled across your website and I am so happy I did! I made these french fries for dinner and my husband(who is very picky) stated they need to be on the menu again. The entire pan was gone in no time. Thank you so much for sharing these recipes. It feels great knowing that I am providing healthier food choices for my family. Sending major kudos from Guantanamo Bay, Cuba. I just found your site and I am bookmarking it — you have so many delicious looking recipes I want to try for my family. I’m going to make these but wondered if you recommend using fresh herbs or dried? Thanks for your great work! Hi Kelly. I made them tonight using the dried herbs along with the turkey-veggie-guacamole burgers (recipe also from your site). Both were delicious! I used sweet potatoes. My only problem was, they stuck to the pan and burned on the bottom just before 15 minutes was up. Do you think I should try turning them halfway through or just use a bit more oil? My oven was at 425. Other than that, all went well! Thank you! I’ve made these a couple of times now and they were gone in no time. I had to stand guard over them until the rest of dinner was on the table. I even made extra the second time and joked with them that they ate more potatoes than if I had actually baked them each their own potatoes. Yikes! But, these were so easy and so good. So happy to hear this, Marie! Thanks for taking the time to leave a kind note! You are so sweet!